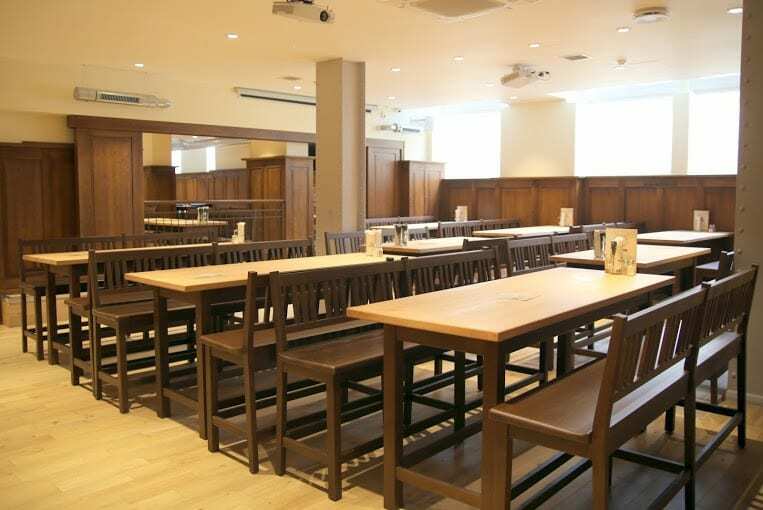 Bierschenke promises an authentic German beer cellar experience in London, and has clearly found its niche, having moved out of its original space onto a huge multi-level site in the London wall buildings a few minutes walk from Liverpool Street Station. With a friend’s birthday to celebrate and a David Cameron-style weekend in Europe sadly impossible we went for the next best thing. The beer hall basics were done well, with piled plates of German sausage and schnitzel and robust two pint steins. Long tables in the basement make it an easy party option for 12 or 20 of your closest drinking buddies to share some platters. The Bavarian theme is followed up with waitresses in mock-traditional dirndl outfits in a decidedly revealing summer style, and waiters in lederhosen. Every Saturday they’re also joined by the Bavarian Strollers OomPah band, and during our visit the band’s traditional music stopped only for frequent renditions of ‘Happy Birthday’, and a brief burst of the Mos Eisley cantina theme. The food was basic pub-quality, but did come in decent helpings. A five-person platter of sausage, schnitzel, sauerkraut, mash and chips (with token kale) was easily enough for six. There were plenty of traditional dishes on the menu and – refreshingly – the vegetarian options were even solidly German. But Mittel-European stylings come with a travel premium – nothing came in at under £10. The steins contained their own Bierschenke lager, proudly advertised as created by a traditional Bavarian brewery, which was quaffable but nothing more distinctive. In the era of craft beer that was a little disappointing but it did keep it accessible for those who weren’t beer fanatics. You could also grab a stein of the wheat beer but the lager seemed a better bet for a long session. Once the stein-banging was out of the system, there was a good selection of German draught and bottled beers, with traditional Bavarian rye beer (Roggen) worth a special mention. But it was the schnapps that offered something special, especially the walnut schnapps with a smooth, spiced flavour that’s perfect for winter. The atmosphere was decidedly lacking, despite the best efforts of the OomPah band. A lack of vaulted ceilings or oaken carved tables is understandable but the stark white of the inset light bulbs felt lazy, and when every hipster has a collection of classic beer posters, the walls needn’t be so bare. The big screens with looping slideshows also did little for traditional beer cellar authenticity, though they are used for Bundesliga football matches and it would be just the place for a rowdy football crowd. That lack of atmosphere felt like part of a larger falling between the beer benches of pub and restaurant. We were asked to leave a card behind the bar which didn’t quite seem to fit with the dining experience. Equally there was Saturday night music and no complaints about people dancing on the benches but nothing about the lighting or spacing of the tables that suggested it was encouraged. Biershenke will fill you up with beer and sausage and send you rolling home with a contented stomach. However, it’s not worth cancelling the Oktoberfest visit just yet. Bierschenke can be found at London Wall Buildings, 4 Blomfield Street, London, EC2M 5NT. There also exists a tiny garden that houses baby turtles in its small lake. West Coast is over the New Madrid Fault. Since alluvium is incredibly soft, it erodes in a very short time or may be quickly covered over by new deposits, thereby quickly hiding proof earthquake fault lines.